Bring that brewmaster touch to your home with the Personalized Brewing co Pilsner Glasses. Show off with your name and year personalized on each 16 oz glass and growler. 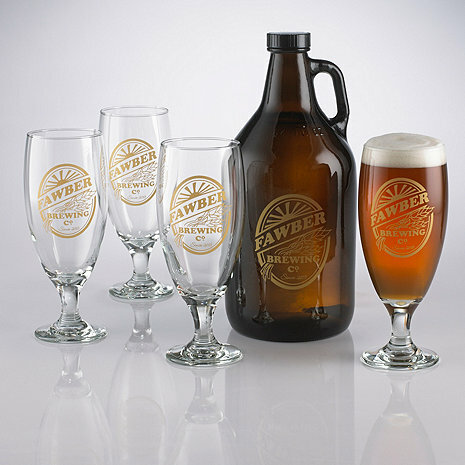 Bring that brewmaster touch to your home with the Personalized Brewing co Pilsner Glasses. Serve your favorite beers just like the Beermasters at your next gathering. Show off with your name and year personalized on each 16 oz glass and growler. Dimensions: 5- 3/4" H, Top Dia: 3- 3/8", Bottom Dia: 2- 3/8"
Is there any chance that I could have these personalized growler and pilsner sets delivered to Glendale, CA by Wednesday, March 5th? I realize this is short notice, but it would be for our wedding party. A total of 9 sets would be ordered. BEST ANSWER: Thank you for your question, the normal lead time on this item is 4-5 weeks. Please contact our sales consultants at 800-356-8466 and they can reach out to the vendor to see if they offer any expedited service. Great for the Beer Lover! I purchased this as a gift. They loved it! It is used often and the "envy" of the neighbors.